Greg Rowland batted well for Newborough. Nassington became the first team to reach the semi-finals of the Burghley Sixes last night (July 6). Conor Craig, who hit a half-century on the opening night, was once again the man in form for Nassington. 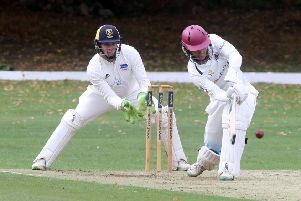 He struck an unbeaten 41 as Nassington totalled 80-2. Oundle started their reply with a bang as Mark Hodgson smashed 22 off Tom Norman’s opening over. But once Hodgson departed their chase petered out and they finished 18 runs short on 62-4. In the two other matches last night - both first round clashes - there were wins for Newborough and Baston. Newborough cruised to victory against Castor after racing to 90-1. Greg Rowland hit four fours and two sixes in his 32 not out and Ash Fisher three sixes in his unbeaten 22. Castor found runs hard to come by, particularly off Kyeran Ellery (1-8) and Vamshidhar Parvathaneni (1-16), and ended up well short on 60-2. Baston’s passage to the semi-finals was also plain sailing. They comfortably chased down Oakham’s 72-3 with eight balls to spare. Sam Janes top scored in Oakham’s 72-3 with 38 not out and then Rob Dunn (27no) and Liam Davies (18no) steered Baston to 73-0.